I was at my local hobby store one day and found a can of Testor's Mopar Panther Pink on sale at a super discount price. 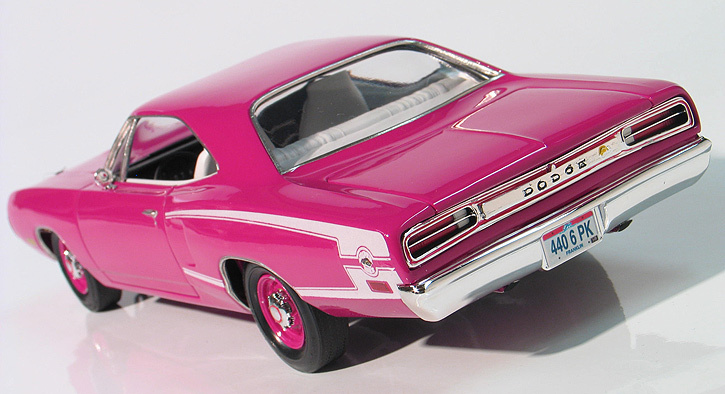 Panther Pink was the name of a special order factory paint color available in 1970 on many Dodges and Plymouths. It's one of the more outrageous hues available in a series of Mopar colors called High-Impact Colors. Judging by the rarity of model cars and real cars I've seen in this color I'm guessing it wasn't a popular color either on the hobby store shelves or on the showroom floor. Being a Mopar muscle car fan though, I bought it because I knew I'd get around to using it eventually. 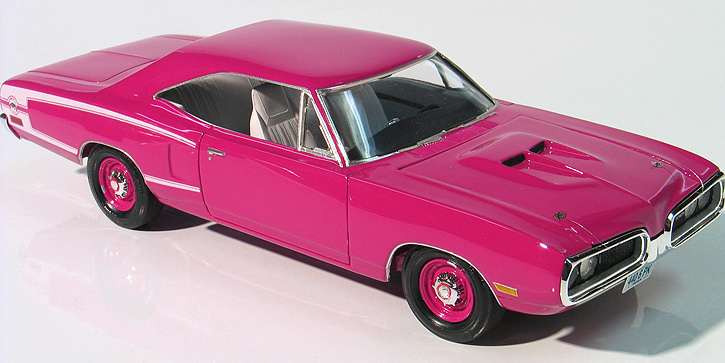 One of my modeling goals is to build a Mopar muscle car in each of the factory High-Impact Colors. I've considered using this color on a couple different Mopar muscle cars I've built but finally decided to use it on my 1970 B-Body Dodge Coronet 440 6-pack Super Bee replica. I've always liked the styling of the Mopar muscle cars. Chrysler had some very aggressive looking car designs during the late '60's and early 70's. In my opinion, there was none more aggressive looking than the 1970 Dodge Super Bee. With it's twin hoop bumper the face of this car looks very angry, like some sort of mad insect. That's why I've always thought it ironic that the car was available in a very girly shade of factory pink paint. 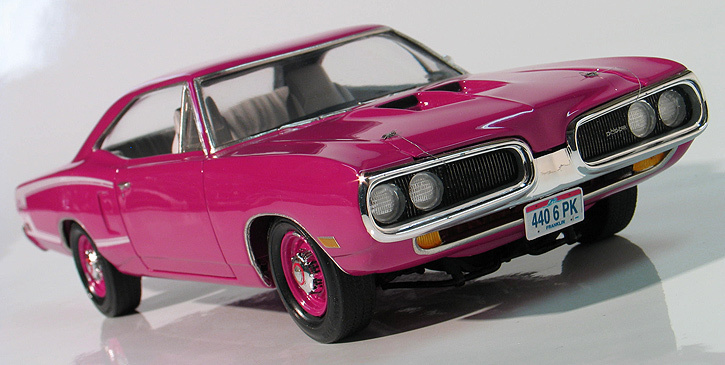 I like building models that have a little bit of a twist to them, so I thought it would be neat to build a replica of one of Dodge's most manly looking cars in one of their most girly looking colors. I also wanted to build a stock version featuring some different factory options than what was offered in AMT/Ertl's kit. 1970 Super Bee's were available from the factory with either the flat Coronet hood with twin fresh air scoops included in the most current issue of this kit or a pitch fork style hood. Interesting enough, MPC included the pitch fork style hood back in the original 1970 issue of this kit. When the tooling was updated by AMT/Ertl in the '90's the pitch fork hood was replaced with the other style. Since I wanted to use the pitch fork style hood instead, I found someone on ebay casting a resin repop of the original hood. I bought one and used it here. The Super Bee was available with several different factory wheel options. The AMT/Ertl kit includes the optional Magnum 500 wheels. Those wheels are correct for this car, but since the Super Bee was based on a stripped down Coronet many people who bought them ordered the cars with cheap steel wheels to save money. Many owners then replaced them shortly after delivery with a set of mag wheels. I decided to replace the kit wheels with with a set of steel wheels and dog dish hub caps for that "as delivered" look. The steel wheels are my own resin cast pieces which I made from a mold of the wheels included in a Johan '68 Chrysler kit. The hub caps came from an MPC Dukes of Hazzard Sheriff's Dodge Coronet kit. The tires were taken from the Model King '70 Buick kit. After painting and decaling the body, the paint was clear coated using PPG concept 2000 urethane. The interior was done in white and black with hand painted wood trim. Lastly, I added photo-etched hood pins, retaining wires made from a guitar string, and custom made license plates. The rest of the model was built to a curbside standard. This Dodge represents a curious bit of Mopar history and adds another addition to my Mopar collection.